Interested homeowners are invited to attend and participate. 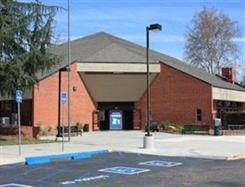 The meeting time is 6:30 pm and the location is the Borchard Gym at 190 Reino Road. See entrance below. Meetings are held on the second Thursday of each month. The Fascinating Story of Dog Poop! Under-Slab Water Pipe Break: Should I Repair or Repipe? CO Alarm Is Now Mandatory! Their email address is board@oakridgenp.org. An email sent to this edress expands to multiple emails, a copy going to each board member. No one else sees these emails except the board members. Their email address is mgmt@oakridgenp.org. An email sent to this edress goes only to the management company; no one else sees these emails. The Board and Management page contains additional contact information. In 2012, our association released new architectural rules and new architectural request forms. In 2010, new paint colors were adopted. In 2011, new Bylaws were adopted, and on March 1, 2012, new CC&Rs were recorded. All these can be viewed on the site. Fees for 2019 are $93/quarter. View the HOA fee history since 1986 and compare to inflation. We have contracted with PayLease to give Oakridge homeowners easy payment options. Call them at (866) 729-5327 to make a phone payment; or Register online to automate your payments and go paperless or simply to make a one-time payment. View the liability insurance policy for the Oakridge Estates Community Association that is in effect as of Aug 29, 2018. If you find errors on the site, have questions, or would like to suggest improvements, please don't hesitate to contact the webmaster, who is an Oakridge homeowner.